By request, I’m publishing this recap of the information and subsequent discussion topics that arose from my presentation at SAP TechEd Barcelona 2017. Please forgive the length, as this was a quite robust discussion and I want to capture as much as possible. For those who don’t know me, my name is Jamie Cantrell and I work with the SAP Community Experience team, managing our blogs platform. I’ve personally been with SAP for just about five years now, but my membership in the SAP community of professionals started in my first “real” job, working with Colgate-Palmolive Co. My internship was in the Global IT Service Center, owning our knowledge management database and processes. We were using SAP products throughout our business, but I really didn’t have a deep understanding of what products we used or why. At the time, I was also studying SAP case studies in my MBA program. I learned that SAP was a giant, a leader in enterprise software and supply chain management. I learned that their products had empowered companies to work smarter and more efficiently. Even so, as an individual consumer, I wasn’t about to go out and buy some SAP products for my home computer. When you hear the word “brand,” what do you think of? Have you ever heard the term “Business of One”? This phrase refers to a growing trend of individuals who no longer think of themselves as employees. These people consider themselves independent businesses, like consultants, whether they have full-time positions with a single company or not. They know that the only thing that will live on throughout the course of their lives is their own career path, so they negotiate work contracts as if they are their own company, are always keeping an eye out for their next big gig, and more importantly, they are constantly aware of the market for their skills and experience. Why do you think this trend might be growing? In the United States, we were hit very hard by the recession. In particular, middle income, “white collar” workers were the most impacted. Many, many people lost their jobs, their retirement savings, and their homes. My parents’ generation believed that loyalty to a company would be rewarded with job security. As a result, they did not invest time and energy into managing their personal brand. For those who lost their jobs as a result of the recession, this made finding a new job nearly impossible. Being comfortable in your job and your current situation creates a tendency to fall out of touch with the market and lose understanding of what skills employers are looking for. Those who lost their jobs in the recession had to start building their presence in this new market from scratch because they never expected to have to start over. Throw the increasing globalization of the job market and now, they have to differentiate themselves from the hundreds of thousands of others just like them. Up and coming professionals learned from the experiences that we witnessed and we know that there is no such thing as true job security. When it no longer makes business sense to keep you, more often than not, you’ll find yourself at the long end of the unemployment line unless you are already prepared to find a new opportunity. So, what is a “personal brand” anyway? Like a company’s brand, the personal brand is the story that you tell the world about yourself and your work. Defining your personal brand starts with a conversation you have with yourself. How do you want people to think of you? Do you want to be known as the expert in your field? Do you want to be known as someone who raises up other people? How you represent yourself can define the opportunities that come available to you. Fill in each box with a bullet list. Examples of strengths might be technical skills, personal characteristics, etc. 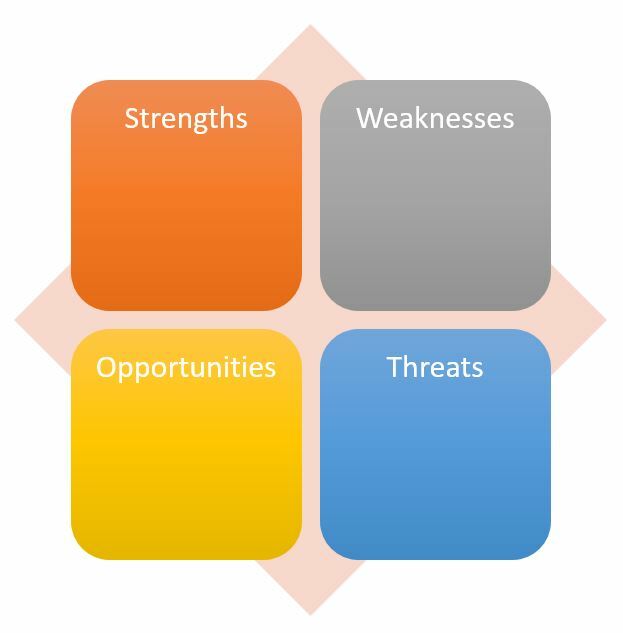 Weaknesses could be areas of personal improvement you know that you need to work on, or skills that you know aren’t quite up to par compared to other candidates in the market. If you don’t have specifics yet, a simple statement like “outdated technical skills” could be a starting point that you can elaborate on later. This is not necessarily a good-bad analysis (that all depends on your attitude!). Instead, you want to honestly assess the situation as it is today. Remember, this is just a tool to help you form your brand identity. Opportunities could include new jobs created by emerging technologies (blockchain, machine learning, AI, VR, etc.) or new industry requirements and regulations (GDPR comes to mind), personal development (certifications, courses, etc. ), or other such opportunities where your unique skills and experience would be valuable. These should reflect what you want to do and not just what you are currently qualified for. Threats could also be, for example, emerging technologies (e.g. new coding languages) that threaten to make your skills obsolete. In addition to helping you form your brand story, the Opportunities and Threats segment of this tool should also serve to drive actions that you want to take to help mitigate risks or take advantage of opportunities (such as taking a training course). Performing this analysis will give you a good starting point for forming your brand story. From here, you should form a statement that encompasses your strengths, your passions, and where you want to go. Remember, if you don’t tell your own brand story, someone else will; and it may not be the story that you want to be told about you. Are you familiar with the term “imposter syndrome”? This is the emotional beating that many professionals give themselves when put in a position of defending their own value. It is the belief that, despite all evidence to the contrary, you are not as smart, skilled, knowledgeable, or qualified as you believe you are. It is that nagging self-doubt in the back of your mind that if you get too much visibility, if you assert yourself and your opinions too much, people will see through the facade that you’ve built and see that you are an imposter. So, why is this relevant? Well, as you are forming your brand story, you may notice yourself second-guessing or undervaluing the contribution you make to your company and your industry. This can be especially challenging if you are someone who values humility and teamwork. The first step in overcoming this is to acknowledge the problem for what it is – a creation of your own insecurities. Then, try writing a list of concrete achievements or contributions that you’ve made. (And yes, supporting others on your team or in your org to accomplish objectives count as achievements.) You are valuable. Don’t sell yourself short. No one is going to be a better advocate for you than you. “What is an elevator pitch?” you might ask. This is a brief statement about who you are, what you do, and why your work is valuable. The elevator pitch takes into account everything you discovered in your SWOT analysis and turns it into an easily consumable story that you use to form people’s opinions of you as a professional. Once you’ve gotten your elevator pitch down on paper, you’re ready to dig into your digital toolkit. One of the most important things to keep in mind when deciding which channels to invest your limited time and energy into is the audience that you are trying to reach. For example, if there are dominant channels in your industry or profession, you should focus on growing your presence there instead of others where your reach will be limited. The Community website offers the opportunity to share your expertise and build your professional reputation as an expert in your field through writing blogs and answering questions. It facilitates connections between members. It offers name recognition for active, expert members and gives newer members a chance to benefit from contact with those experts. These capabilities will only be enhanced in the coming days as we make improvements to the site. The community of SAP professionals around the world is strong. We became strong through the free sharing of information and ideas, the facilitation of building professional connections, and the overall support that we share with each other on this journey with SAP. I was approached by several different members at TechEd Las Vegas this year, who shared stories about how being a member of the community has affected their lives. One member shared that he suddenly had to move to another country and he had no job lined up. He was worried about how he was going to survive there. Ultimately, he reached out to his SAP community network and was offered a job based on the reputation he had built in the community. Bottom line: being active and helpful and professional in the Community site translates into greater industry reputation and concrete connections with other SAP professionals. THIS is the job security of today. Be sure that as you grow your community presence, you are maintaining professional appearance (use a nice headshot for your profile image and use your real name) and professional behavior. Treat others with respect and come with a positive and growth-oriented mindset. This rule also applies to every other digital tool in your toolbox. Remember: What happens on the internet lives forever. Don’t post anything that you wouldn’t want on a billboard outside your future boss’ office window. Next on the list is LinkedIn, which most of you are hopefully familiar with. If you don’t have a LinkedIn profile, you need to build one today. LinkedIn is essentially a digital resume in the ‘traditional’ format. LinkedIn offers a convenience factor for finding new jobs and applying to them efficiently and consistently. Many job sites these days integrate directly with LinkedIn to pre-populate fields on the application form. Now, while I don’t advocate the shotgun approach (aka apply to every job you’re remotely qualified for), there’s something to be said for saving time in your job search. So, even if you’re not looking for a new job today, this one will save you time in the future. There are tons of articles out there on best practices for LinkedIn, but I will share with you the most important: use your elevator pitch. On your LinkedIn profile, you have the option to write a headline and a summary. These sections should succinctly reflect what makes you and your work valuable. Your elevator pitch is perfect for this. Should you choose to create a site, there are many free options, such as WordPress.com, that will allow you to set up a blog-style site quickly and easily. If you want a custom URL (e.g. yourname.com), you might consider a 3rd party hosting service (personally, I use dreamhost.com) where you can install a free content management system (CMS) like WordPress. These are user-friendly options for those of us who are not web developers by profession. I’ve seen a few different successful ways to utilize the personal website for personal branding. One of which is the “business of one” view. This site is truly dedicated to furthering your brand message. It will focus primarily on showcasing your work (maybe you include a portfolio or links to past projects you’ve worked on) and your elevator pitch. Another option is to utilize a more content-focused format. If you enjoy writing or creating podcasts or recording videos in which you share your expertise, this format will work well for you. For example, I use my personal website to share posts that are typically more generic observations and advice, focusing on business topics that, while relevant to many in the SAP world, are not specific to SAP. Does it matter what format you use? You should choose a format that best achieves your goals. Is the personal website required? No, but it’s useful in ensuring that when employers research you, you control the message they receive. I often call Twitter “the great equalizer” because it is a unique platform that gives me, a new grad, an executive board member, and the president of the United States the same microphone through which to speak. It offers the ability to connect with people you might not otherwise have access to. Moreover, while building your personal brand, Twitter gives you immense reach to people you may not have close relationships with yet and helps you reach new people that you might not even be aware of. Twitter is a great supplement to your work in the Community, to help increase your reach to others outside your network. Your personal brand is only as strong as your visibility. The most important takeaways from this post are that there are a wide variety of tools available to you. Use the ones you are most comfortable with and that your intended network is comfortable with. Engage often. Putting up a profile is not sufficient. Digital media is about two-way conversations and every interaction is an opportunity to create a new contact or strengthen an existing one. Your brand requires attention and energy to maintain. If you wait until you need it, you’ve waited too long. Previous Is STEM Education the Future of Schooling?